This is a guest post by Leo Widrich (@leowid on Twitter) of BufferApp, a Twitter application for scheduling Tweets. Staying on top of the Twitter game and keeping my followers posted throughout the week can sometimes turn into quite a hassle. Most Twitter Clients such as HootSuite or TweetDeck offer features to schedule tweets individually, which I always found to be quite time-consuming and clunky. In order to overcome this issue and also to stop posting too many tweets at once, there is a new Twitter App I want to tell you about that I have been using extensively for the past weeks. It is a nifty App called Buffer. Using Twitter Buffer App I can put the same tweet or RT (retweet) into the buffer of multiple Twitter accounts ONCE and Buffer App will send them out to each account at a different time! Making use of Buffer is very intuitive. All you do is throw a few tweets in your Buffer and Buffer App posts these tweets for you throughout the day. I can edit the Tweet to say whatever I wish, click the green “Add to Buffer” button and Buffer App automatically sends out the next Tweet in my buffer at the interval I selected for each account. 2.) How did your Tweets do? 3.) When will I tweet? How can Buffer help me right away? Creating consistency in your Twitter stream is more important than ever as the noise on Twitter is growing with its exponentially increasing user base. The tricky part is that I always wanted it to be both timesaving and without flooding my followers with too many updates at once. Having my own account on a blast and contributing to more Twitter noise made me feel very uncomfortable. This is where Buffer comes in. It allows you to add lots of tweets to your Buffer at once in a very time-consuming manner. These tweets are then tweeted well spaced out over the course of the day and don’t create an information overload for your followers. As of this week Buffer has also published a new feature which allows you to invite friends in a super simple Dropbox-style manner. You can tweet or email your personal referral link to your friends and both you and your friends get additional spaces for tweets in your Buffer. You don’t schedule each tweet individually, since you simply add to Buffer. Buffer provides you with full analytics for your buffered tweets to track your impact. I am using Buffer daily and throwing tweets into my Buffer whenever I like something has turned out to be a really fun thing to do. If you use this well, then you can just forget about planning and if it is the right time etc. Just add things to your buffer when you see or think of something. Great info on this new twitter tool. I will have to try it out!! Lisa, thanks a lot for your comment. Great post! I just signed up for Buffer and filled it up with Tweets. So we’ll see what happens. I loved it though because it was so easy to set up. I’ve tried some of those other Twitter auto posters and they were just too difficult to understand and use. (I’m not techy at all). I went for the freebie offer first to see how much I’ll use it but I can already see myself upgrading on Buffer within the next couple of days. Donna, thanks a lot for your kind words here! Exactly, there is a ton of them which make it into quite a hassle, I tried quite a few myself. Glad that Buffer is so easy to use for you, really helps with feedback for us! With the buffer being used to delay posts so that followers aren’t bombarded with too many tweets, is there a ratio of the number of links to your own post versus outside content that you use? As opposed to just tweeting about your own content all the time. Hmm, that is a very good question, I think the ration is about 9:1. So I would tweet 9 tweets with links to other sites and 1 with a link to my own site. I think it is really key not to be selfpromotional, otherwise followers will quickly be turned away. Hope that helps. Do you have a ratio for yourself too? I used to with TweetMeme, Tweetly, TweetDeck but after reading this article I really like the Bufferapp. I am really thankful to growmap.com for give me latest ideas of social networking, specially in Twitter. Daniel, I am really sorry for letting your comment wait for such long time here, somehow the notification landed in my Spam. 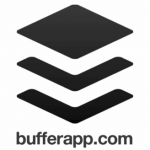 That is so great to hear that Buffer is useful for you! Definitely give it a go, there are quite a few differences to other tweet scheduling services. Stop the Twitter madness. We are not stalkers. Lets just let each other have some privacy. Peter L Masters MCIM would love you to read ..Social Media suicide- Don’t become flat liners- back up your Blog or your dead!! Indeed, really great and useful application – Buffer, I heard about it a few days ago from a friend of mine, also a user of this application. I consider that it’s really good and in my opinion it’s a ‘must-have’ (especially nowadays), in order to get Twitter fans, traffic, attention, this is defintely a ‘must-have’. I will start using it too, thanks for sharing your opinion about this app too. Great job! Adrian, thank your for the kind words on Buffer. Yes, it is just like you say I think if you want to stay on the cutting edge Buffer can really help to make consistent Tweeting effortless. And consistency definitely brings Fans, Traffic and Attention, I couldn’t agree more. I created my hootsuite.com account and sync to my twitter profile. I write all my tweets at one time and predetermine when those tweets go out. Hootsuite.com, are really cool tool in my twitter marketing. Yes, I think Hootsuite really is a great tool to get all your Twitter efforts going. In addition to your favourite Twitter client, you might want to check out Buffer for scheduling as you don’t have to schedule tweets individually, but you simply throw them into your Buffer and thats it. Hey this is really useful, thanks for the review and the link to the app will certainly be giving it a go, thanks again main. Fabrizio would love you to read ..Best Google Adsense- WP Plugin Review! Wow, so great to hear you are finding Buffer useful. Yep, go ahead and give it a spin to see if it works for you. If you have any questions, please let me know :). Glad I could help you out. Yep, from now on simply throw the tweet in your Buffer and forget about it :). Someone can’t even imagine what a great time saver Twitter Buffer App is until someone tries it. Thanks Leo. Steven, many thanks for your kind words. Yes me too I think it saves a lot of time and yet you remain genuine. Thanks for stopping by, really appreciated :). Wow, thanks for this tutorial. I’d never heard of Buffer before but I think it will make a massive difference to the amount of time I spend tweeting. Yes, it is just like you said I think. Buffer will save you a ton of time as you can add to your Buffer from anywhere on the web. Great Twitter find! I like the features and it makes more since than the Hoot suite we were using! I will have to give this a trial run and see how it goes! Hi there, yes you are absolutely right, I have tried Hootsuite too before and it is an awesome Twitter Client. For scheduling I think Buffer really is a better choice. Definitely, give it a go and see for yourself :). Excellent recommendation. I’ve been using timely.is to space out my tweets, it’s even more straightforward, drop in the tweet and tell it to post in the next 30 minutes or let timely.is choose. Great free service for those who just want to solve the problem of not overloading followers with tons of tweets at once. But Buffer sounds REALLY cool. 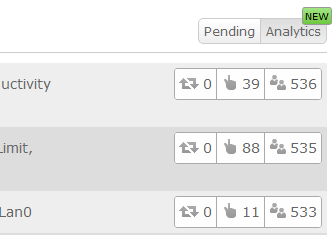 I think I might be switching over because of the Chrome plugin and the ability to have tweets go out at peak times. The only thing that might hole me back is the lack of bit.ly support on the free tier. Many thanks for your comment, yes you are right Timely is quite similar to Buffer. That’s so good to hear, definitely give the Chrome plugin a go. It makes life a lot easier I found, so I can add tweets from anywhere I want. Buffer apps still new for me.. I’m just familiar with tweetdeck. maybe later i will try buffer.. it look interesting.. Many thanks for stopping by. Yes, I am an avid Tweetdeck user myself, totally love it. Sure, give Buffer a go, I think it is a great enhancement to Tweetdeck and helps to bring your consistency of Tweets up. If you have any questions about Buffer, please let me know :). I will ask you later if i have some question.. 🙂 thanks..
Yep, I have heard about TweetAdder, but never gave it a go, do you think it is better than Buffer mentioned above? I would love to hear your experience on it. Many thanks for stopping by, really considering giving it a go, heard good things. I really like the idea of getting easy access to statistics about how your tweets have performed. Not so sure about the scheduling and @buffering” beacause what I really like about twitter is the instant nature of it as a form of communication. Really like the point you are making on the fact that Twitter has a very instant nature. I totally agree with you and I believe making use of Buffer might not really come in clinch with that. The way I see this is that Buffer helps you to create the action on Twitter and frees you up for the interaction and engagement, let me know if that makes sense to you :). The reason someone very active on Twitter would want to buffer tweets is so that we can reply to many close together but have those replies go out with time between them so we don’t flood the timelines of Twitter users who do not follow a lot of people. While Twitter is in some ways “instant”, we are not all looking at the same tweets at the same time. Any tweet that comes to me @GrowMap I reply to the next time I am on Twitter. That could be within minutes, but it might also be hours later. If twenty tweets came in since I was online and I answer them all I want the replies to go out gradually so they do not annoy my other followers. That is what buffer app does and why I have been trying for a long time to get others like CoTweet to offer that feature. Hi James, many thanks for stopping by. You will definitely find it easy to incorporate both, just like you said. 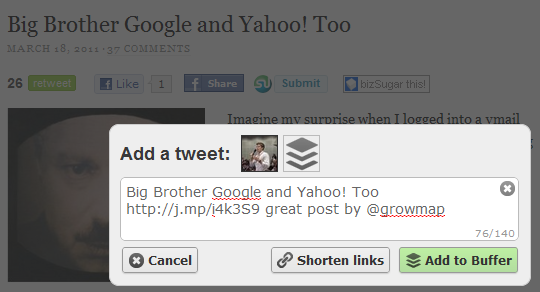 The browser extensions make it super simple to add tweets from any article you are reading. No worries, glad you found the post useful :). The best way to have a consistent Twitter presence is to feed your favorite high quality blogs directly into your Twitter account. See my post about How to Use Twitterfeed. What a time-saving apps for twitter. A must have apps for twitter of the business owner. Aybi, many thanks for stopping by. Indeed, just like you say it is supposed to save you lots of time. Glad you stopped by, hope you give Buffer a spin yourself :). Oh man, Joel and Leo are going to think I’m a rabid Buffer stalker now, lol. This has got to be the third (fifth?) review of the Buffer app I’ve seen inside a week. I’ve said it before, but I’ll happily say it again: I <3 Buffer! It makes my Twitter duties so much more delightful and easy, and it really is so, So, SO much simpler than TweetDeck or Hootsuite. Not only that, but it's compatible with Chrome, which I also love. And I'm one of those app "purists." I can't stand downloading and installing tons of stuff onto my browser, but Buffer is so amazingly awesome that it's one of only 3 apps that I deemed worthy enough to install, next to Blog This! and WiseStamp. Delena, no, not at all! It is a true delight to have you with us on our Journey, all your kind words are so much appreciated. Yep, indeed me too I believe it makes the whole deal a lot simpler than Hootsuite or Tweetdeck. Wow, I am very honoured you made Buffer one of your 3 Apps downloaded for Chrome. Well, I am left to say is: keep on Buffering :). Many thanks for stopping by! Thank you so much, Delena, for dropping in and adding your thoughts on Buffer App. As soon as Leo told me what it did I said, “where have you been”. I’ve been trying to get other apps to add that functionality for a long time now. I hope you’ll check out some of the other posts here. There is much that can benefit bloggers and businesses alike. Seems like today is Bufferapp day, just finished commenting on Daniel Snyder’s blog about his enthusiastic review of Bufferapp and, as a user myself, I can say only good things about it. Thanks for your amazing support man. Haha, I hope it is Bufferday :). Hi Sam, many thanks for your comment. 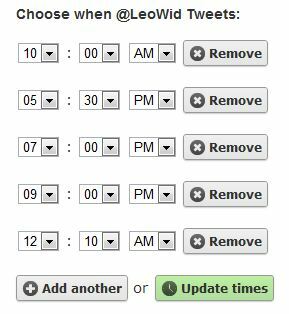 Yep, exactly, it really saves a lot of time, when there is no need to schedule each tweet individually. Sure, give it a go, you can simply access it from http://bufferapp.com, no need to even download anything. Thanks for the post! Very helpful. I signed up for the buffer App and had it working in a few minutes. The only thing that threw me is having to download Chrome to use it. I usually use firefox for my daily work but switching over to Chrome to use the buffer app is no problem at all, just copy and paste the URL of whatever you are working on, very easy! Hi Keith, many thanks for stopping by. Really glad you signed up for Buffer and are finding it helpful. Oh, No problem at all if you are a Firefox user, as there is a bookmarklet you can use for Firefox. Hope that helps, as I think it is very important to continue with the workflow you have had before :). You can access it simply by clicking on “goodies” when you are logged in. Hope that helps, many thanks for the comment :). But you failed to mention that over 5 buffers means you must subscribe to Buffer at a cost. Only five time slots per day are available in the free version, so you must be paying or you are getting comp’d. Still Buffer is an interesting approach. I have grown tired of all the multiple steps it takes to schedule a tweet in Hootsuite. Thanks for bringing Buffer into my social buffer! many thanks for your comment, you are absolutely right, there is a constraint on the free plan. 5 Time slots per day and 10 tweets in your Buffer that is. I totally agree putting it in there for everyone to know right from the start is definitely a good suggestion, I will keep it in mind for sure! I like the click tracking aspect. I’ve wondered how to do that normally. Dennis Edell would love you to read ..Take Your Blog Commenting to Brand New Heights! Yep, the fact that Buffer tracks your Tweets really helps to measure your impact, especially if you really want to follow a strategy on twitter. Many thanks for stopping by, I hope you give Buffer a go, would love to hear what your views are :). It is great job. I have first time read such a unique article about tweeting. Hi Gail, I’m assuming this is a guest post from @LeoWid but the author bio box is missing. Ileane, many thanks for stopping by. It is actually a co-production between me and Gail. She edited the post and made a few changes so it would really fit the readership of this blog. Really glad you found it interesting – again :). I always thought Gail is a guy. This is great..I never heard of this..I will give it a go..
Yep, exactly, just like you said Karen, someone once said Buffer is “A Human Way to Schedule Tweets”, which I think is another great way of puttin git.